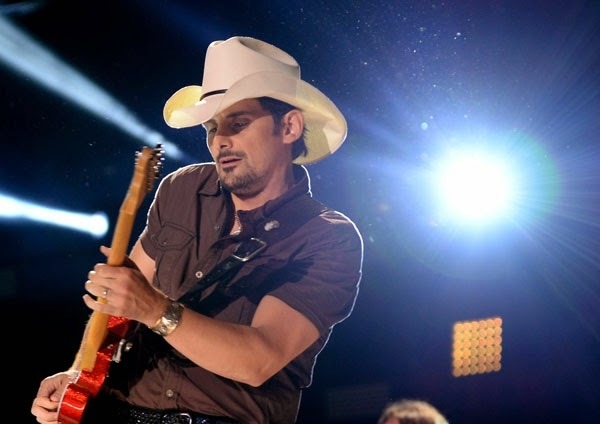 During a recent visit to New York, Brad Paisley has a hotel room with a Central Park view but no guitar, so he does the next best thing: He grabs his iPhone, punches up his forthcoming album, Moonshine in the Trunk, and cranks one of its songs as loud as it can go on a mobile device. Out comes a barrage of guitar riffage, followed by a solo that leaps from Van Halen-style fret-tapping to bluegrass-on-speed velocity. "It's like, 'What is that?'" Paisley grins. "I couldn't have done that in 1989 — you think I could've gotten away with a tap solo?" He mimes a shrieky air-guitar solo. "But it fits our format now. It all becomes country eventually, somehow. We assimilate it like the Borg." With hardly a pause, Paisley names Buck Owens and His Buckaroos' 1966 classic Carnegie Hall Concert. "The greatest band in country music at their height, playing live in front of an audience that didn't know what to think of them. The audience at Carnegie Hall falls in love with Buck right before your very ears. They played their asses off — Don Rich has never played better — and their harmonies were this tight. Buck was so unique and so charming, and he had perfect pitch. I asked him if they had stage monitors and he said, 'No, we couldn't hear anything.' They were just signing and blasting through." Rather than pick a current chart-topper, Paisley went underground, selecting alt-country singer-songwriter Jason Isbell's "Elephant." "Unbridled, ridiculous art. I heard the song and I couldn't believe somebody would write about a woman with cancer. It has the F word and it's used like you think, not as a cuss word. It's just bizarre and really cool. It's not at all modern commercial country. It's interesting to hear what somebody does when they have no interest in playing by the rules." "The Eagles — they're the American band. The Stones were a big influence on me and the Beatles, obviously. But they're all British. Here you have this band coming out of America that's as country as anything. The Desperado album, all that 'Doolin-Dalton' stuff? That's a country album, through and through. No question. Then they turn around and do Hotel California. The coolest thing. Something about cactuses and rock music is a good combination." As a kid, Paisley devoured albums like Eric Clapton's Slowhand and Jeff Beck's Blow by Blow and had his mind blown when he caught a Clapton concert years ago. But his first-ever rock show was a Huey Lewis and the News gig in his native West Virginia in 1986. "They'd just released Fore! and the current single was 'Jacob's Ladder,'" he recalls fondly. "It was fantastic. Huey was standing on top of the monitors playing harp — oh my God. They were just burning it down in the Eighties, and then it became uncool to like them. But you look back at his music and it's awesome R&B. And it's so close to country. You think about 'Working for a Living' — that's a steel guitar away from country." The one in "The Power of Love," of course. "I could tell Chris Hayes was a badass when I heard that song. It's a song written for a movie, so they probably threw it together quickly. But he does this pentatonic thing in the middle of this major song. He always found a way to use that blues and jazz influence in what he did." No surprise here. "Stetson. They make my hats. It's a really personal thing. A hat has to be shaped to a person's face so it fights just right. It has to be done right. If you put my hat on, with my shape, you'd look like an idiot. If the bill is too high or too saggy, you look like a European tourist going to their first country concert."